On July 16-19, the California Gift Show played host to respected social entrepreneur and leader in the Afghan Fair Trade Industry Dr. Ghulam Ullah Muradi. An entrepreneur who works with Afghanistan's most under served and remote ethnic minorities, Dr. Muradi is a new kind of soldier fighting the war in Afghanistan - an individual who has bravely chosen to return home to a country still torn by violence to provide Afghanistan's poorest citizens with an opportunity for an education and economic opportunity. OWP got the chance to sit down and talk with Dr. Muradi during his time in the States. OWP: Is this your first trip to the US? Dr. Muradi: Yes, this is my first time in the US. It is also my first flight and my first time outside of the Middle East. The travel time to get here was 24 hours in total: Dubai to London, London to Dallas, and Dallas to L.A.
OWP: How has your trip been so far? Dr. Muradi: So far the trip has been wonderful. At the exhibition we had good sales of Afghan traditional jewelry. We sold almost all of the product I brought. Next year, I am going to bring my wife, if we can get sponsorship. That would be the first time that my wife will have traveled outside of the Middle East, and also the first time she will fly on a plane. Dr. Muradi: I am the first Turkman doctor in Afghan History. Out of 3 million Turkman in Afghanistan, I am the first doctor. I started my medical education in Kabul, Pakistan, then moved to Islamabad, where I met my wife. We married, and finished our last year of medical school together. OWP: Why did you choose to return to Afghanistan, despite continuing security risks? Dr. Muradi: Most refugees returned to Afghanistan after the Americans established some semblance of peace. They wanted to return. No one wants to live as a refugee. It is very difficult. As soon as the Taliban was ousted from power, my wife and I returned to Kabul and finished our degree at Kabul Medical University. OWP: What inspired the creation of TWARA and its crafts business? OWP: How did you become involved with TWARA? Dr. Muradi: After one year, I became involved and started running the handicrafts center. If members had handicrafts to sell, I would track who contributed work. OWP: How did you become involved with One World Projects? Dr. Muradi: After we met Cristina (an OWP consultant and buyer), she offered to help improve the quality and sales of the rugs. She arranged a holiday market for three days and invited (OWP Founder) Phil Smith to came to the event. 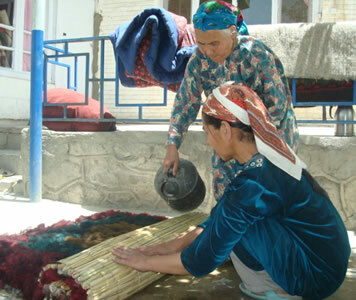 Fifteen days before the market, Christina met with me and told me to improve the quality of the rugs and create a series of provided design and then she would evaluate what people thought of the rugs at the market. The first day, completely surprised us all. We sold a ton of rugs - the most out of everybody at the exhibition. Phil Smith was quite impressed, and we've been working with OWP ever since. OWP: What do you see as the future of the TWARA group? Dr. Muraid: Next year, we are planning to work with Christina to start up a couple new carpet designs. It takes a lot of patience to do this sort of project due to the difficulty of transporting information across hundreds of miles of unpaved roads. Christina has already purchased a CD for designing and making carpet patters. This will improve the rate of innovation and give me an opportunity to participate in the design process. I'll probably still leave the coloring decisions up to Christina or my wife, though! 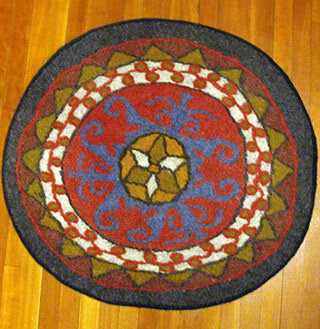 Check out TWARA rugs and jewelry!